Educational Goal: The learning and development of individual talents in order to nurture just and ethical global citizens. Ritsumeikan’s history begins with its establishment as a private academy in 1869 by Prince Kinmochi Saionji, an eminent international statesman of modern Japan and advocate of Freedom and Internationalism. In 1900, Saionji’s protégé Kojuro Nakagawa retained Saionji’s spirit and established the Kyoto Hosei School, an evening law school that was open to working people. With Saionji’s blessing, the name of this school was changed to Ritsumeikan Private University in 1913. At present, the Kinugasa and Suzaku campuses in Kyoto, as well as at the Biwako Kusatsu Campus in Shiga and the recently opened Osaka Ibaraki Campus (OIC) in Osaka combined are home to 36,000 students learning under the core educational philosophy of Peace and Democracy. In order to nurture just and ethical global citizens, Ritsumeikan is working to foster creativity and the development of individual talents on a solid foundation of academic achievement. Ritsumeikan University has been selected as a designated institution of the "Top Global University Project "by the Ministry of Education, Culture, Sports, Science and Technology (MEXT), Japan. The ministry-appointed panel of experts selected 37 institutions among 104 applications and these institutions hold the “Top Global University” status as of October 1st, 2014, to the end of fiscal year 2023. The "Top Global University Project" has been established as a way to give financial support to 37 public and private universities aiming to promote comprehensive internationalization and become world-class research and education institutions. With our selection for this prestigious project, Ritsumeikan University will serve as a model for globalized schools. 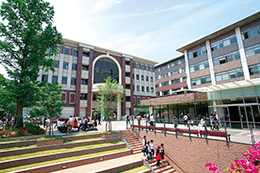 The Graduate School of International Relations (GSIR) at Ritsumeikan University was established in 1992. Located Kyoto in Japan. Since then, we have established and strengthened our position as an internationalized and top ranked graduate school with approaches highly esteemed both domestically and internationally. GSIR is the only official member of APSIA (Association of Professional Schools of International Affairs) in Japan. GSIR is considered a leading research and educational institute of international relations in Japan and around the world. GSIR’s 20 years of educational and research achievements have produced over one thousand alumni including international students from 51 countries as well as JDS, World Bank, and MEXT-funded students. Graduates are active in international organizations, the Foreign Ministry, governments in their home countries, international aid, and globally active private enterprises. JDS Fellows are able to study in the English-based academic learning program, "Global Cooperation Program". The GCP is a pioneering English-based Master’s Course program, focusing on international relations, and development and cooperation. For JDS Fellows from Nepal, the Graduate School of International Relations offers a curriculum which aims to cultivate professionals of international cooperation knowledgeable in international economy (economic friction), international politics (regional security), and development issues. In order to achieve this aim, our program includes the following features. Students in this program develop an advanced, academic balance necessary for International Cooperation professionals based on courses composed of the following four pillars. Students will learn fundamental theories necessary for negotiating and policymaking as an international cooperation professional from courses such as international relations, international political economy, trade theory, and international law. Students will study international politics, economics, and past experiences surrounding the Asia-Pacific Region. Students will be able to produce solutions to issues as they examine many case studies of international cooperation and development of various countries including Japan and ASEAN countries. Debates will also be conducted focused on dealing with challenges posed by development issues. Students at our institute enhance their understanding of diplomacy by participating in symposiums with international aid agency staff members and diplomats that are held frequently. Emphasis is placed on gaining a basic understanding of Japan’s economy, politics, and diplomacy. Students will learn the background knowledge between ASEAN countries and Japan and their relationship while utilizing lessons from Japan’s past development experiences. Students study actual environmental issues as stresses of rapid economic development. They also develop the ability to make policy recommendations conscious of effective use of energy resources and the environment through precedent examples from various countries regarding environmental issues, globalization, and the relationship between economic growth and the environment. Students study in-depth research topics related to their area of work and are placed in a seminar class (Advanced Seminar) of a specific academic advisor during their period of enrollment. Through weekly seminars, students deepen their technical knowledge and complete their Master’s thesis after oral defenses (Research Proposal Meeting, Interim Progress Meeting). A guidance system is setup with multiple faculty members focused on the final oral defense. In the beginning, students will develop fundamental competency on Master’s thesis composition and research methods through skill-based courses. Our quality faculty is a big feature of the program for those aiming to be economic diplomacy professionals and focus on our main research areas that include politics, economics, law, society and socio-cultural global governance, international cooperation and development, and multicultural issues. Students have the opportunity to utilize our extensive faculty body and receive detailed guidance on various research topics of international students. Both the English-based and Japanese-based programs are designed to allow domestic students from around the country and international students from around the world (115 students from 27 countries as of May 2018) to study side by side. Students will take the special seminar, Professional Training: International Organization and Development, which is designed for JDS Fellows and aims to foster young governmental officials. In this course, international and Japanese students, under the guidance of multiple professors from a variety of professional backgrounds, debate on topics such as international politics, business management, sustainable development, and local government policy for sustainable development, and more. Those topics include Japan’s experience with economic development and pollution issues. Students will brush up on academic English and take part in everyday Japanese language training. All courses can be taken in English. Courses such as Academic Writing will help improve students’ academic writing and comprehensive management skills. Another goal is that all students acquire a beginner’s level of Japanese. International students will acquire the ability to use basic conversational Japanese and write via the Japanese Conversational Program. This will enable students to develop basic Japanese language ability and better understand Japan’s culture and affairs. As an improvement to the current program in Comprehensive Japanese I and II, students will discuss international relations issues using Japanese. You can select other courses (language courses, research method courses, etc.) and other Program courses. Students who successfully fulfill the degree requirements (30 credits of course work), complete 2 years or more study period and whose Master’s thesis reflects the student’s academic ability to approach international issues from multiple perspectives will be awarded an M.A. degree. Lectures are provided to share cutting-edge information by faculty members, lecturers, visiting professors and specially invited professors who are currently active in international fields such as United Nations. Furthermore, some visiting professors from partnership organizations provide dynamic lectures based on their work experiences. An academic advisor will be determined under communication/screening with faculty advisors, based on the Student’s research topic before enrollment. Academic advising staff will help support this selection process. Former Director General, Development Bank of Japan Development Studies of Mekong Basin Countries such as Cambodia, Vietnam and Lao PDR. Development issues in transition countries toward market-based economy. Former JICA Expert: Myanmar Agriculture and Rural Development in Southeast Asia especially in Myanmar. Studies dynamics of human-nature interaction under recent changes of social and natural environments, sustainable agriculture and appropriate development for local people. Student Dormitories: Kinugasa Campus boasts several dormitories for international students including the International House Taishogun, which is a well-equipped new dormitory completed in the fall of 2015. It is also possible for the university’s on-campus cooperative’s real estate agency to provide students with single room accommodation. Library Services: Library facilities include the state-of-the-art Hirai Kaichiro Memorial Library, which newly opened on Kinugasa Campus in April of 2016. The library features over 1,000,000 books, multiple computer and multimedia stations, and rooms students can use for group study. In addition, from private booths to group tables there are a wide variety of study booths and seating areas for library users, ensuring that all students can find an area that fits their study style. *Ritsumeikan University, as a whole, has a collection of 3,252,171 books. (Japanese: 2,272,773, Foreign language: 979,398 (as of March 2017)). *Students may also borrow materials from libraries on other campuses using our electronic library services system. Health Center: Located on campus, the health center promotes the health of students through a combination of general health support services and a medical office that specializes in internal medicine. All students must take part in a yearly health check that assesses their overall health condition and, depending on the result, follows up with additional tests as necessary. Students with any persistent health issues are put under watch and given follow up medical guidance until graduation. Counseling: Professional counseling is available in English or Japanese Monday-Friday. Training Room: Our campus has a newly opened gymnasium and training room featuring brand-new state-of-the-art training equipment, a rock climbing wall, and various specialty machines for student use. Here, we have trainers residing nearby and students can use the gym facilities free of charge. Restaurant / Cafeteria: A combination of 6 restaurants and cafeterias are located across the campus, offering a place to catch a meal while enjoying a conversation with fellow students or a professor. Religious and Dietary Considerations: Halal food and vegetarian options are available at some of the eateries across campus in an effort to better meet the dietary needs of our diverse student body. Additionally, we also have a room which students may use for prayer. International Center: The International Center, located just next door to the Graduate School of International Relations, provides support for Ritsumeikan’s large international student body including organizing orientation for incoming students, promoting exchange activities, and managing scholarships. Assistance is available in English, Japanese, and Chinese. As of May 2018 we have thirteen full-time staff dedicated to assisting international students working in the center. Beyond Borders Plaza: Located near the center of campus is the Beyond Borders Plaza – a global student commons where students can study, relax, take language courses or hold their own events. The lounge is full of books, magazines and newspapers in a variety of languages as well as board games, a computer station, and a TV airing CNN so that students may keep up to date with breaking world news. Other Support: Ritsumeikan University is establishing the JICA/JDS English Program for JDS students to improve applied English ability at the graduate student level. Additionally, the university strongly encourages JDS students to enroll in the JICA/JDS Support for Daily Conversation in Japanese, which the university intends to establish so that students can adapt smoothly to life in Japan by learning basic conversation skills and hiragana/katakana. Finally, Ritsumeikan University is planning to conduct programs such as the JICA/JDS Company Visit Program* and Kyoto Cultural Understanding Program* to better meet the needs of JDS students. *Final program name to be determined. 3) A professional network with experienced faculty members, guest professionals of international organizations, Japan’s government and international cooperation agencies, and colleagues from around the world. We believe that we can provide attractive learning opportunities here in Kyoto, the historical and cultural center of Japan, home to highly acclaimed universities and research institutes. GSIR has been playing a leading role in the field of international relations and cooperation in the academic and professional community in Kyoto. We encourage our students to participate in projects to connect academics in Kyoto with professionals from all over the world. We look forward to welcoming young government officials who have enthusiasm to study international relations to widen their views of politics, economics, and socio-cultural issues in the contemporary world and to build a mutually-beneficial partnership between Japan and Nepal.